Pies, cobblers, crisps…talk about comfort food! A sweet and cake-y or crumbly topping paired with a warm fruit filling make for the ideal combination of a flavors and textures that scream EAT ME NOW. Cobbler transports me back to vacation days at my grandparent’s in South Carolina…and my cousins, brother and I couldn’t wait to taste grandma’s homemade treat. Topped with her homemade peach ice cream, we all reached food nirvana (and a blissful sugar-induced coma)! I was thrilled to be assigned Margaret’s Tea and Scones blog for the last hurrah for the Secret Recipe Club! It’s the final reveal for the club, and I want to all the hosts and members for making so many wonderful memories and fantastic recipes 🙂 For the finale, I couldn’t help but choose a “sweet ending” and a dish that evokes a huge heartfelt smile…so when I saw Margaret’s recipe for Peach Cobbler, I was sold. Originally, I was deciding between Margaret’s Coconut and Salmon Laska Soup or her Chai Spice Scones yet a dessert seemed appropriate for this occasion, and I was not disappointed! I can’t wait to try other fruits and combos as well! A few other recipes that had me still loving fall flavors are her Sweet Potato Praline Brownies, Pumpkin Beer Bread and Sweet Potato Curry Puffs — there’s no denying winter squash and sweet taters are some of my favorite foods. They are most definitely on my list of dishes to try! To make it allergen-friendly, I swapped out the all-purpose flour and whole wheat flours for a combo of oat flour and coconut flour to make it gluten-free. Margaret mentioned the cobbler needed to be a little sweeter so I opted for coconut sugar for the granulated sweetener and added some stevia to bump up the sweetness without a ton of added sugar. I also swapped non-dairy milk and butter-flavored coconut oil for the butter (and canola) to make it dairy-free. I had a few blueberries in the freezer and some leftover ground chia seeds so I tossed them in along with the frozen peaches for some added color, fiber and omega-3s. 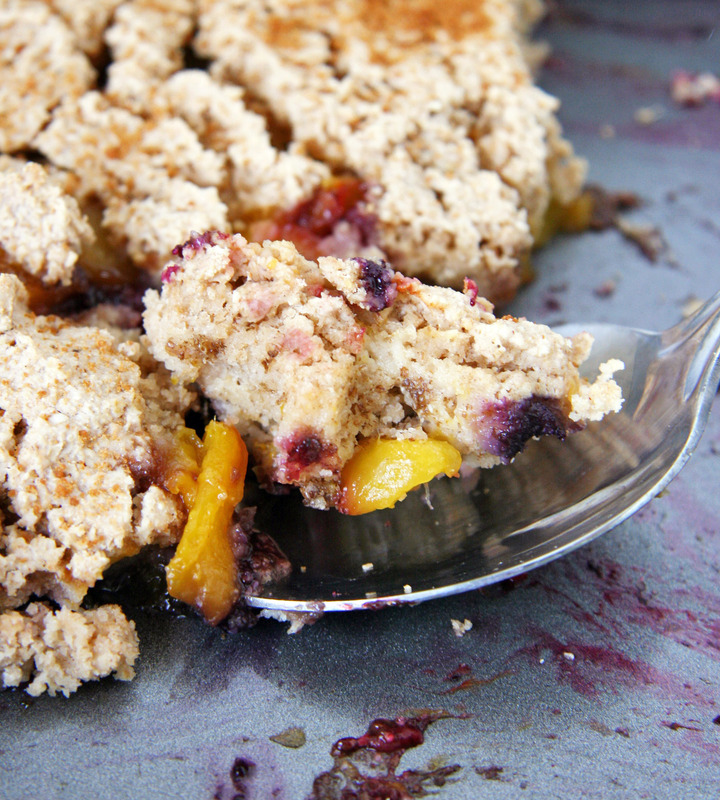 What a lovely recipe, the blueberry-peach reminded me so much of my sweet grandma! 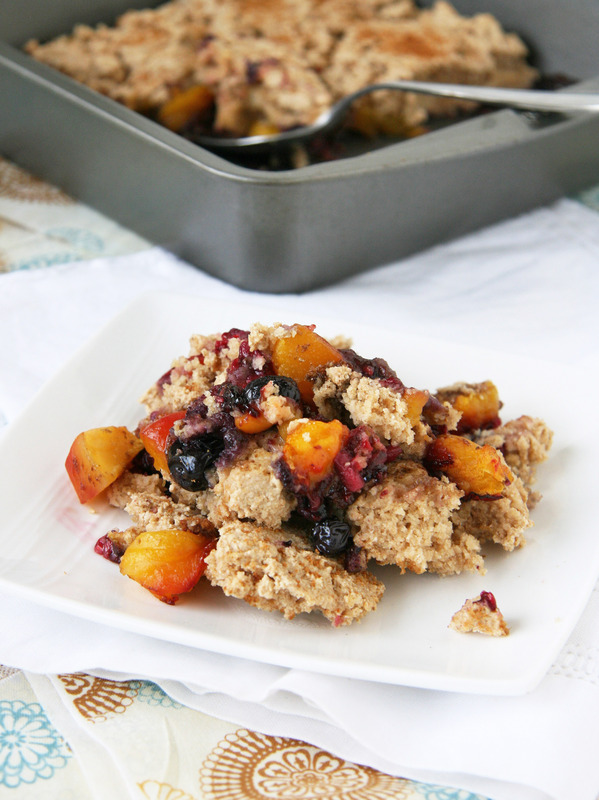 With these ingredients – oats, peaches, berries, coconut oil and chia…this made for a guilt-free yet decadent-tasting breakfast and a sweet AND satisfying dessert. 2. To make the filling, if using fresh peaches, bring a 4-quart pot of water to a boil and fill a large bowl with ice water. With a paring knife, slice through each peach skin from end to end, but leave the peach intact. Place the peaches in the boiling water for 30 seconds. Using a slotted spoon, transfer the peaches to the ice water for 30 seconds. Remove the skin from the peaches. Split the peaches in half, remove the pits, and slice each peach into 8 slices. 3. In a large bowl, toss together the sliced peaches, berries, lemon juice, cinnamon, and starch. Add the brown sugar, 1 teaspoon at a time, to taste depending on the sweetness of the fruit. Pour the peach mixture into an 8-inch square baking dish. 4. To make the topping, in a medium bowl, whisk together the flours, granulated sugar, baking powder, and salt. Add the milk, butter, and oil and stir to combine. Distribute spoonfuls of the batter over the peaches, leaving some patches uncovered. Sprinkle with the cinnamon. Bake until golden brown, 25-28 minutes. To view other recipes from this month’s reveal, click the link below! I’ve recently discovered rutabaga and it’s many ways to enjoy it! I’ve seen it at the store for years sitting next to the turnips and daikon radishes and never gave them a second glance, though I’m not sure why?! Over the last few months, I’ve experimented with various preparations and recipes and they are quite versatile and delicious. While I love my quinoa and brown rice, sometimes I need a dish that’s light and filling and packed with nutrition… and this recipe fits the bill. Rutabaga is a bit sweeter than a turnip, compliments the hearty greens and they hold up nicely when pulsed into rice-like pieces in a food processor and sautéed in a skillet. 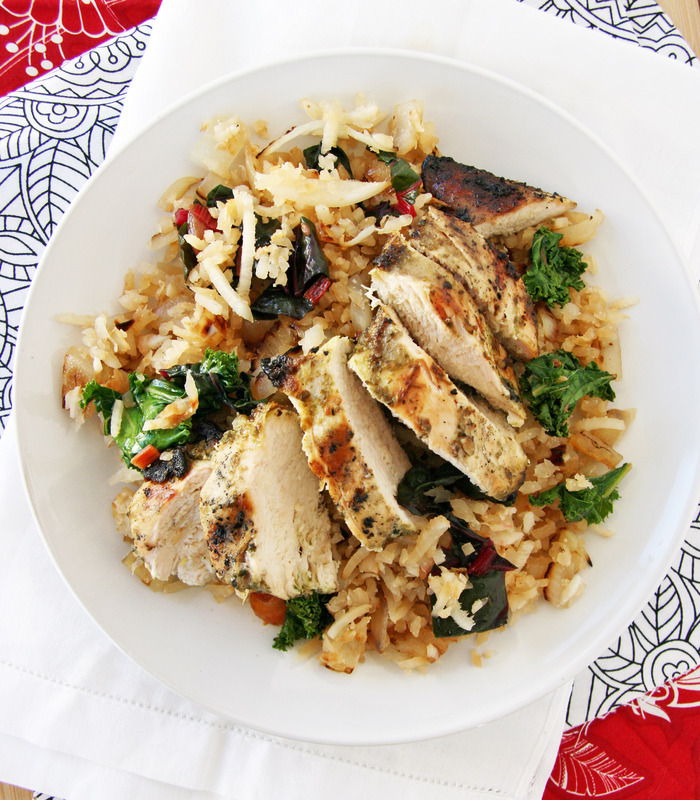 If you are a fan of alternative rice dishes or you avoid grains and/or you follow a paleo lifestyle, add this dish to your repertoire! This AIP-friendly pesto can be used as a dip, a marinade, a sauce or a spread. You can whip up a batch quickly and marinade chicken or toss it with fresh roasted veggies for some added zip. For a vegan dish, substitute grilled portobella mushrooms or roasted cauliflower steaks for the chicken. Oh, how I love options! In a tupperware container with a lid or in a gallon zip lock bag, add chicken, pesto, lemon juice and salt. Shake around fully coated and let marinate for at least 4 hours, preferably overnight. To make the “rice”, pull out a food processor and use the “S” blade (you might be able to use a high-powered blender but I haven’t tried this). Add the cubed rutabaga chunks and pulse until it resembles a rice-like size. Preheat your outdoor grill or indoor grill pan (or skillet). Grill the chicken for 5-6 minutes on each side until cooked through depending on thickness (chicken is safely cooked when internal temperature reaches 160 degrees). Tent the chicken with foil and let rest 10 minutes before slicing. While chicken is cooking (or while resting after if you don’t want to multi-task), heat oil in a skillet over medium-high heat. Add diced onion and cook for 2 minutes. Add garlic and rutabaga rice and saute for another 2-3 minutes, stirring occasionally. Add sea salt, kale/chard/greens and broth and stir. Cover with lid or aluminum foil and reduce heat to medium and cook for another 5-8 minutes, checking to see when the rutabaga “rice” is tender. 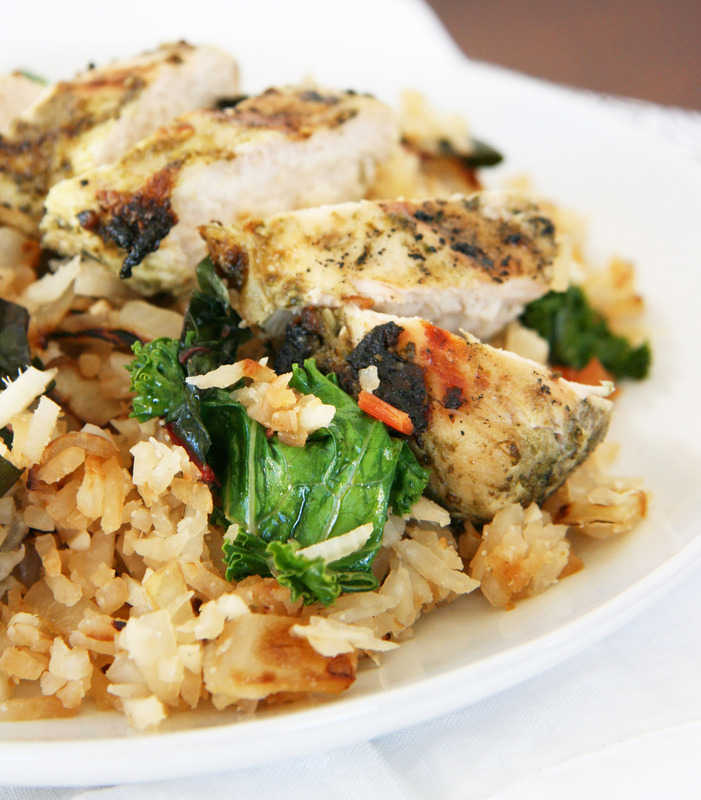 Taste and season rice with salt if needed and/or toss in a drizzle of lemon juice or pesto. 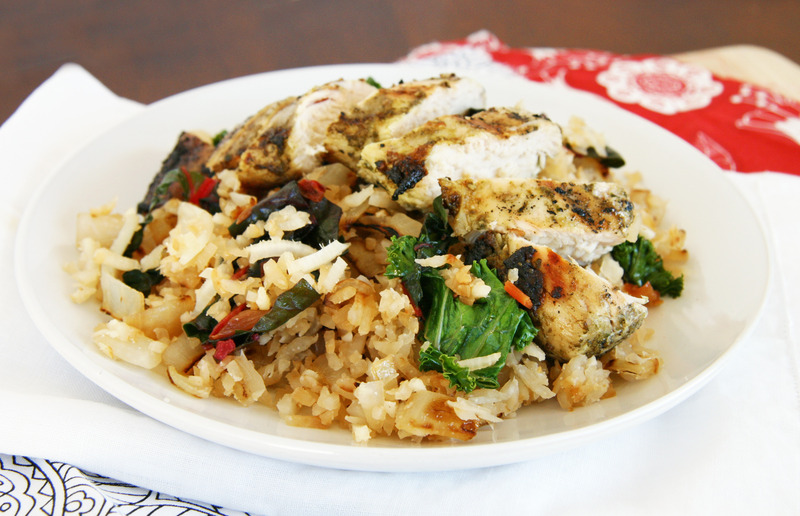 Serve with chicken and enjoy! Directions for pesto: Combine all ingredients in the bowl of a food processor or blender. Blend on high for a smoother sauce-like pesto until smooth or pulse for 30 – 60 secs until pesto reaches your preferred consistency, stopping as needed to scrape down the sides of the blender or food processor with a spatula. Store leftovers in the fridge for 3 days. When I came across these beauties from Brown-Eyed Baker, I knew I needed to make an allergy-friendly version! They almost have a Halloween-ish feel to them as well with the colors and the pretzels – so HAPPY HALLOWEEN…and what better way to celebrate than with a treat?! 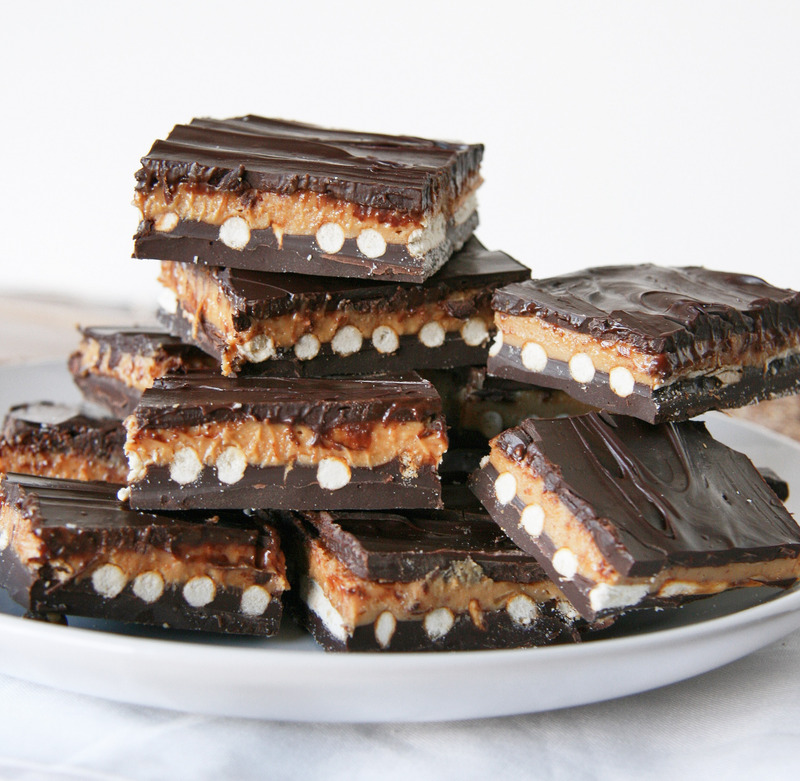 These bars are inspired by Ben and Jerry’s Chubby Hubby ice cream, which I used to adore. A sweet and salty combo will win me over every time when having to choose between an overly sweet option. There’s something about the contrast that really reels me in. I’ll sprinkle a bit of sea salt over most desserts for that little “extra something” almost every time. A more bitter dark chocolate is always my favorite but if a sweeter chocolate is your preference, that can certainly be substituted. If you have a peanut or nut allergy or avoid legumes, use sunflower seed butter (which tastes the most like peanut butter) or substitute your favorite nut butter such as hazelnut, almond or cashew butter for a different flavor. I’ve been loving on collagen lately so I’ve been coming up with ways to incorporate it into different recipes (read about health benefits here); however for a vegan or vegetarian version, feel free to omit since it doesn’t effect the flavor. 2. Place half of the chocolate in a medium bowl and microwave on 50% power in 30-second increments, stirring after each, until completely melted. Pour the chocolate into an even layer in the prepared pan (or divide evenly among mini silicone cups). 3. Gently place the pretzel sticks in an even layer on top of the melted chocolate, I broke them in half but this isn’t necessary. Place the pan in the refrigerator while you prepare the next layer. 4. Whisk together the melted oil and peanut butter, then whisk in the sweetener and collagen until completely smooth. 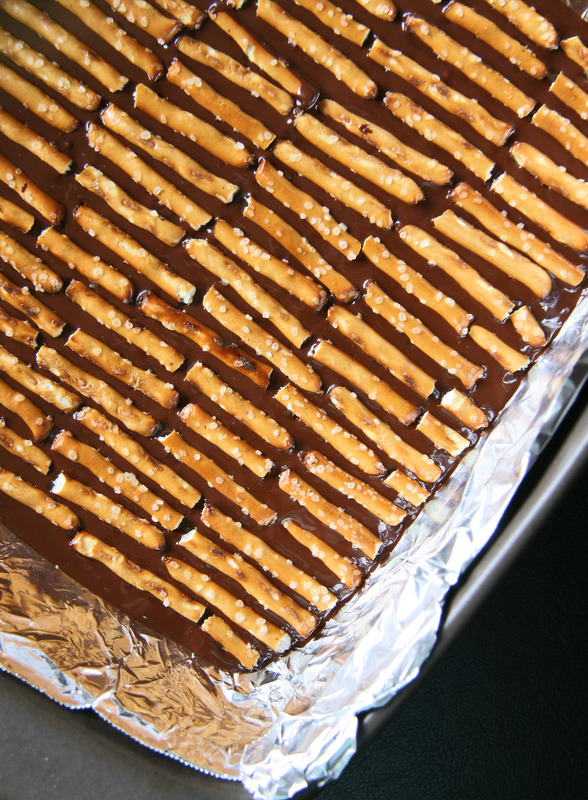 Spread in an even layer over top of the pretzels. 5. Melt the remaining half of the chocolate using the same method as in step #2. 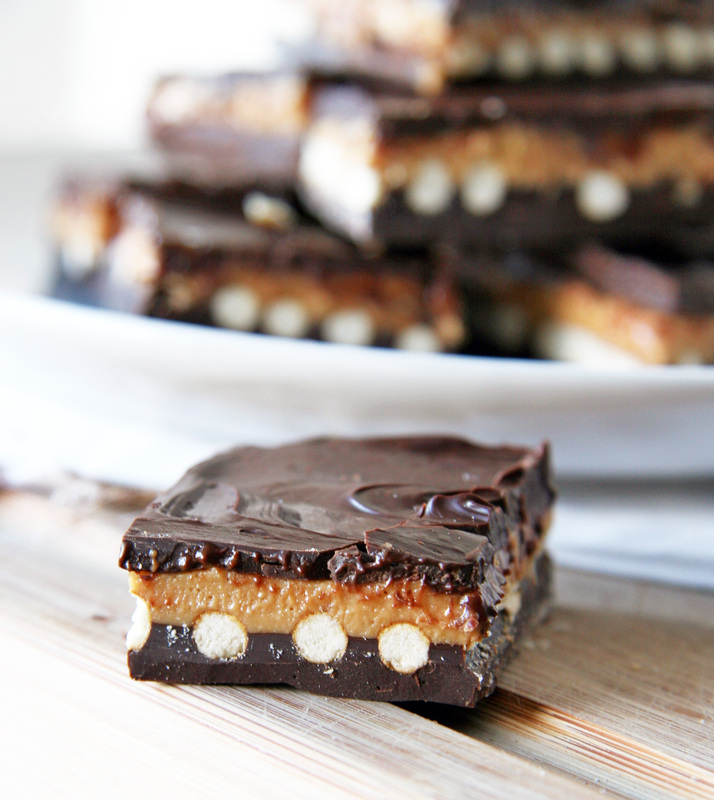 Pour the melted chocolate over the peanut butter layer and use an offset spatula to spread in an even layer. Return to the pan to the refrigerator until set, about 30 minutes. Cut into bars and serve. It snowed this week…yep, our first snow of the year already arrived! Growing up in a warmer Texas climate, the quick change of seasons in Montana never fails to catch me off guard 🙂 As the temperature drops, I find myself in the mood for more comfort meals as I warm up to the idea that winter is starting to dig in it’s heels for the long haul. Lentils and chickpeas are comfort foods in my book…not only do they have a creamy texture, they’re hearty and filling and can accompany a warm pita or can be used in skillet meals, breakfast dishes and even dessert. 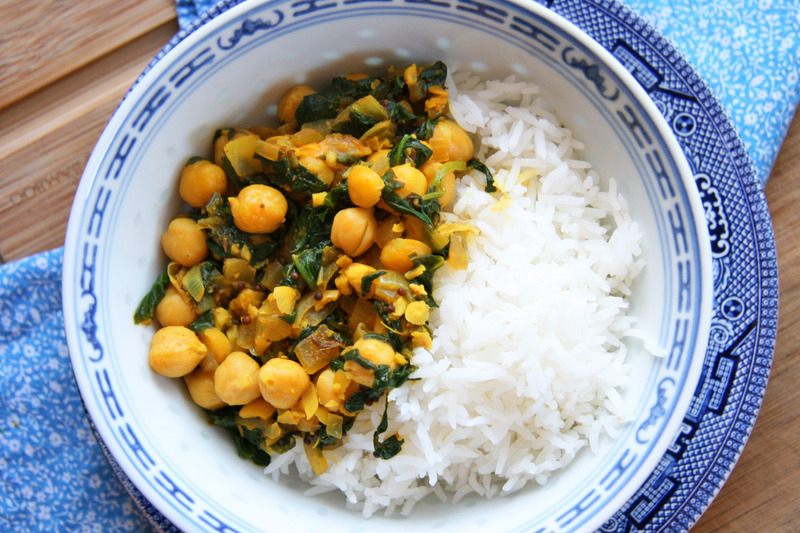 This dish for chickpeas and spinach served over cozy rice hit the spot! Another idea I am still warming up to is this post is the second to last for the Secret Recipe Club monthly reveals. Sadly, we got the news this month that the club is coming to an end after 5 years… and I have so enjoyed my 4+ years in the club, I can’t believe it’s been that long! For this month, I was assigned The Big Sweet Tooth blog, and what fun I had searching through recipes and getting to know her Rafeeda! 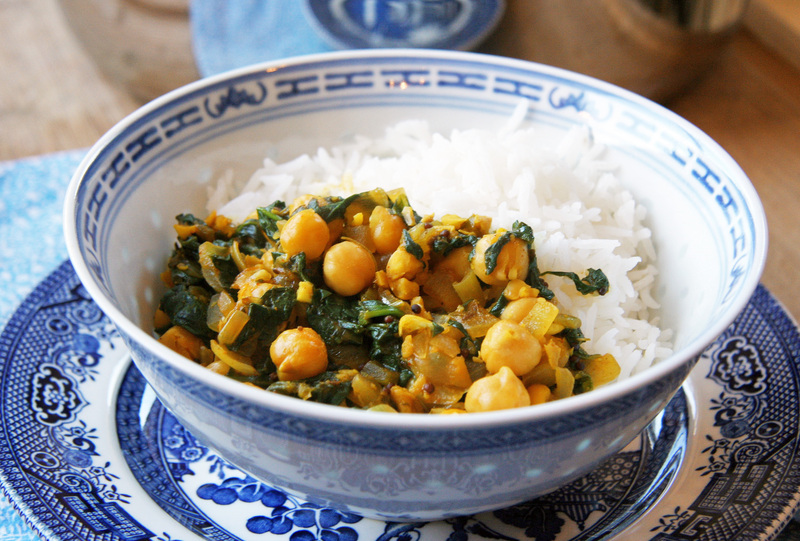 Her blog has a huge variety of recipes, with an extensive collection of Indian dishes. Amongst the many that piqued my interest are her Ripe Plantain Lentil Sweet Curry (the combination of ingredients plus the sweet and savory aspect are intriguing), her South Indian Rice Cakes (these are naturally gluten free and fermented! ), and her Egg-free Mango Chocolate Marble Cake (this is a perfect fall-looking cake). Pressure cook the lentils/chickpeas in sufficient water with turmeric and salt. (I’m not that familiar with pressure cooking though I own one so I followed these instructions for cooking but used 3/4 cup chickpeas and the tumeric and salt in the recipe above). In a saucepan, heat coconut oil over medium-high heat. Crackle the cumin and mustard seeds. Add the serrano/green chillies and ginger garlic paste and saute until you smell a nice aroma. Add the onions and saute until wilted, then sprinkle with little salt. Add in the spinach and masala powders (tumeric through garam masala) and saute till the spinach looks wilted. 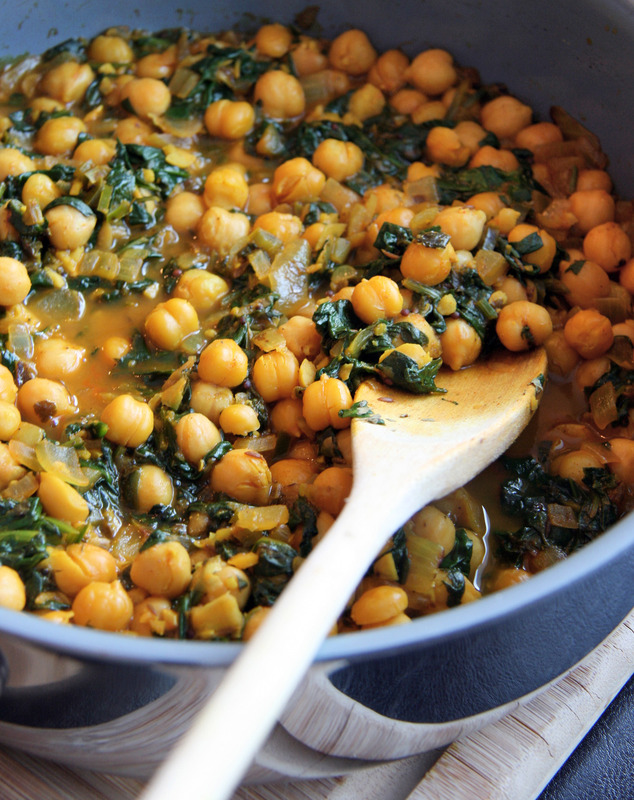 Add the cooked chickpeas/lentils into the sauteed masala, cover and simmer for five minutes. Add the fenugreek leaves and lemon/lime juice or apple cider vinegar and give a final mix. Taste and season with additional salt if desired. Serve warm with rice or rotis. ** If you cannot find the Kashmiri chili powder, you can substitute a mixture of paprika and cayenne pepper – about 3 parts paprika to 1 part cayenne pepper. For other recipes from this month’s reveal, click the link below!